What is Community Friendly Lighting and why do we need it? What’s often missing in many public lighting installations is, unfortunately, lighting design. Municipal and utility lighting staff is tasked with meeting standards but seldom have any training in lighting design and installations aren’t evaluated for lighting quality. This usually results in meeting lighting level and uniformity targets but completely misses something that they may not understand: visual comfort. Fortunately, visual comfort is something we all know instinctually. If you walk or drive on a street and the lighting makes it feel unpleasant or difficult to see, it’s probably because it lacks visual comfort. While there are many elements that contribute to good visual comfort, ignoring just one creates problems. These elements include: appropriate lighting levels, contrast, brightness, color and/or spectral power distribution (SPD), and lastly, and most importantly, glare. Why is visual comfort so hard to achieve? Good lighting design is complex and requires careful attention to details. Computer-aided design has simplified the process somewhat, but it still requires a trained individual who can manipulate the elements of the lighting design to achieve a balance between excessive brightness and the very complex aspects of human vision. Glare and inappropriate SPD are the two major factors that degrade visual comfort and both are linked directly to the physiology of the human eye. Glare occurs when the contrast ratio between light and dark exceeds the eye’s ability to adapt. It can be caused by large light sources (electronic billboard) or very small point sources (individual LEDs). Visual comfort is increasedwhen glare is minimized or eliminated. In LED fixture design, diffusion or reflectors can greatly reduce glare. The color of light and its spectral power distribution can influence visual comfort psychologically, as well as physiologically. Harsh cool white light at night is alien to human development. We have evolved under much dimmer and warmer light sources, like fire, and our brains still seem to prefer them. Historically the brightest white light source at night is the moon and even the light of a full moon on a clear night is 50-75 times dimmerthan a typical streetlight. Moreover, staring directly at a typical LED array of a streetlight will result in glare that’s over a thousand timesbrighter that the moon. What can my city do to improve public lighting? 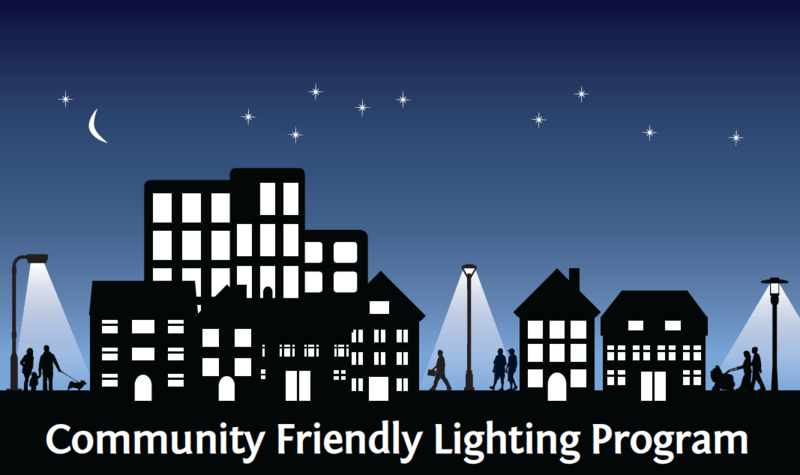 The Community Friendly Lighting (CFL) program encourages public lighting that enhances the character and ambiance of communities by eliminating glare, light trespass, and skyglow while improving visibility and visual comfort. We are working with cities to raise awareness of these issues and provide pro bonodesign assistance. The CFL program also emphases the need for community outreach and involvement by conducting public pilot testing, walking tours, and surveys. Too often when cities are faced with balancing maximum efficiency, cost savings, and lighting quality, they choose lighting fixtures that are too bright and glaring. The result has been detrimental to the quality of life for residents and has resulted in negative press that has slowed the transition to more energy efficient lighting. The SOLA Community Friendly Lighting Certification program was developed to help cities select the best public lighting fixtures and controls, which will help them reduce energy and costs, while also enhancing the quality of lighting for the public. The selection criteria are based on three factors: technical performance, visual comfort, and environmental impact. To obtain the designation, all lighting products must support these goals. No lighting fixture will be included that has short wavelength (430 – 530nm) spectral power distribution (SPD) of more than 25%. While correlated color temperature (CCT) is often used to describe white light sources, it does not accurately characterize the blue content that can increase the perception of glare, and negatively impact ecology and human health. For reference, light sources with CCT of 3000K or less will typically have <25% SPD below 530nm. Lighting fixtures used are IES BUG rated 0 or 1 for uplight and glare. Lighting fixtures must demonstrate superior visual comfort. Smart controls and other lighting equipment that can help cities meet the goals of the program can also be certified. 51% or more of the total street and road lighting fixtures have been upgraded to energy efficient fixtures that use >=33% less energy than previously installed ones. Luminance levels do not exceed 120% of minimum recommendations using applicable lighting standards. Light sources produce less than 25% spectral power distribution between 430 – 530 nm. Lighting fixtures installed are IES BUG rated 0 or 1 for uplight and glare. Adaptive controls are installed to reduce lighting levels to meet lower recommended practices after peak traffic period. The next phase of the program will be a public lighting best practices guide that cities can use as a standard for lighting design. It will incorporate all the principles of community friendly lighting design that SOLA has advocated since its inception. The guide will be supported with training materials and a certification program for designers and installers.